Medial epicondylitis or ‘golfer’s elbow’ is mostly a tendinous overload injury leading to microtearing. Thereby tendon degeneration appears instead of repair. The most sensitive region is located near the origin of the wrist flexors on the medial epicondyle of the humerus. Sometimes the patient also experiences pain on the ulnar side of the forearm, the wrist and occasionally in the fingers. All these muscles have the same origin: the medial epicondyle of the humerus. 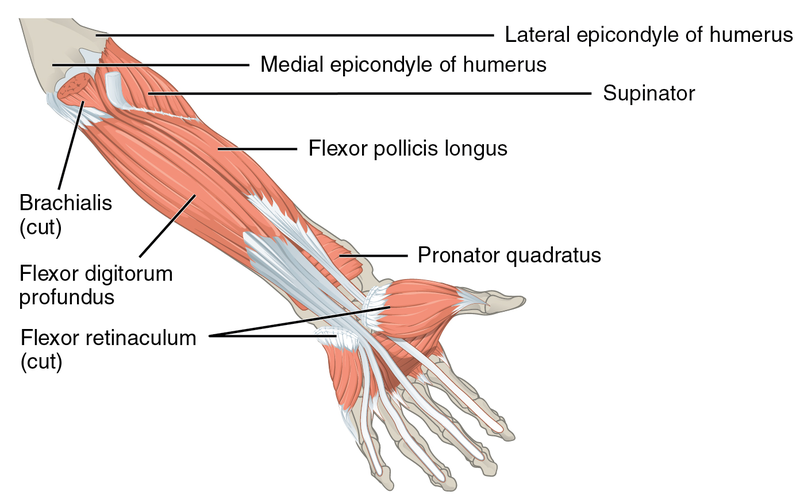 Most frequently the pathology occurs in the musculotendinous origin of the flexor carpi radialis and pronator teres. But large diffuse tears can also occur in the palmaris longus, flexor digitorum superficialis and flexor carpi ulnaris. Medial epicondylitis has a lower incidence than lateral epicondylitis (tennis elbow), with the former containing only 9 to 20% of all epicondylitis diagnoses. The ‘golfer’s elbow’ and ‘pitcher’s elbow’  are synonyms. The pathology occurs in baseball pitchers as a result of high-energy valgus forces created by the overhead throw. It has also been reported with tennis, bowling, archery, weightlifting, javelin throwing, racquetball and american football. However 90 to 95% of all cases do not involve sportsmen  . Because chronic repetitive concentric or eccentric contractile loading of the wrist flexors and pronator are the most common etiology, occupations such as carpentry, plumbing and meat cutting have also been implicated. The pathology may also be produced by sudden violence to these tendons in a single traumatic event. In many cases trauma at work had been identified as the cause of the symptoms . More specific occupational physical factors associated with medial epicondylitis are forceful activities among men and with repetitive movements of the arm among women. Current smokers and former smokers are also associated with medial epicondylitis, so do patients who suffer from diabetes type 2 . As medial epicondylitis is a tendonosis of the flexor group tendons attached to the medial epicondyle of the humerus, the most sensitive region will be located near the origin of the wrist flexor group. The patient usually complains about pain of the elbow distal to the medial epicondyle of the humerus with radiation up and down the arm, most common on the ulnar side of the forearm, the wrist and occasionally in the fingers  . As epicondylitis is essentially a musculotendinous condition, diagnosis is essentially clinical. Radiographs are typically negative unless the chronicity of the condition had allowed periostitis to develop on the affected epicondyle . In particular the Golfer’s Elbow Test, an orthopedic test, is described as being helpful to diagnose medial epicondylitis . DASH (Disabilities of the Arm, Shoulder and Hand)  is a questionnaire with 30 items to rate the ability, of a person with an upper extremity disorder, to perform daily life activities. The short version of this test is called the QuickDash questionnaire, with only 11 items. It includes a passive and an active test to determine medial epicondylitis. In severe cases of epicondylitis, the patient will complain of pain when he simply shakes hands or pulls an open door. For the active resistance test, the patient should resist wrist flexion. This must be carried out with elbow extended while fully supinating the forearm. For the passive test, the therapist extends the wrist with the elbow extended. When conservative management fails and there is persistent pain after 6 to 12 months and all other pathologies are considered, surgical treatment must be considered. For medial epicondylitis the degenerative tissue at the origin of the flexor carpi radialis brevis is removed during a mini-open muscle resection procedure. This procedure produces low levels of postoperative pain, a short hospital stay and rehabilitation period and early return to daily activities. Fascial elevation and tendon origin resection facilitates the complete visualization and resection of the CFPO (Chronic Flexor Palmar Origin) with limited soft tissue dissection. The indication for injection therapy for epicondylitis is usually chronic pain and disability not relieved by more conservative means, or severe acute pain with functional impairment that calls for a more rapid intervention. These injections seem to have a short term effect (2-6 weeks) and effective in providing early symptom relief . The main goal of the conservative treatment is to obtain pain relieve and an inflammation reduce. These two things will help to achieve a proper rehabilitation and later a return to activities. Nonsurgical treatment can be divided into three phases. - Phase 1: The patient immediately has to stop the offending activities. It’s not recommended to stop all activities or sports since that can cause atrophy of the muscles. The therapy starts with ‘PRICEMM’, which stands for ‘prevention/protection, rest, ice, compression, elevation, modalities and medication'. The affected elbow should be iced several times a day for about a quarter. This improves the local vasoconstrictive and analgesic effects. As for medication the patient can take nonsteroidal anti-inflammatory medication (NSAID). If the patient’s condition doesn’t improve, a period of night splinting is adequate. This is usually accompanied with a local corticosteroid injection around the origin of the wrist flexor group. Some examples of a physical therapy modality are ultrasound and high-voltage galvanic stimulation (but there’s not yet a study that notes their efficacy). Counterforce bracing is recommended for athletes with symptoms of medial epicondylitis. It can also aid when the patient is returning to sport. - Phase 2: As soon as we see an improvement of phase 1, a well guided rehabilitation can be started. The first goal of the second phase is to establish full, painless, wrist and elbow range of motion. This is soon followed by stretching and progressive isometric exercises. These exercises first should be done with a flexed elbow to minimize the pain. Although not yet conclusive, is the belief that strength training decreases symptoms in tendinosis. The short-term analgesic effect of manipulation techniques may allow more vigorous stretching and strengthening exercises resulting in a better and faster recovery process of the affected tendon in Medial epicondylitis. As soon as the patient has made some progress the flexion of the elbow can be decreased. As the flexibility and the strength of the elbow area return, concentric and eccentric resistive exercises are added to the rehabilitation program. The final part of this phase is a simulation of sport or occupation of the patient. - Phase 3: When the patient is able to return to his sport it is necessary to take a look at his equipment and/or technique. These precautions ought to be taken to allow a safe return to activities. 7 to 10 days after the operation, the splint and skin sutures are removed. At this point the physical therapy can start. The beginning of the treatment is characterized by gentle passive and active hand, wrist and elbow exercises. 3 to 4 weeks later gentle isometrics can be done and at 6 weeks the patient can start with more resistive exercises. At last a progressive strengthening program has to be followed. In normal cases the patient can return to activities 3 to 6 months after the operation . Sandra J. Shultz, Peggy A. Houglum, David H. Perrin. Examination of musculoskeletal injuries. USA, Human Kinetics, 2000, p295. The treatment of epicondylitis medialis exists first of all of enough rest together with local application of ice and in some cases the giving of anti-inflammatory medication and stretching. In case of a serious form of epicondylitis medialis, some injections of cortisone can be given (maximum three injections). If all these treatments won’t help, an operation will be inevitable. ↑ 1.0 1.1 1.2 1.3 1.4 Lee AT. The Prevalence of Medial Epicondylitis Among Patients With C6 and C7 Radiculopathy. Orthopaedic surgery. 2010 august. ↑ R. Putz RP. Sobotta atlas of human anatomy. 3rd ed. ; 2006. ↑ 4.0 4.1 4.2 Ciccotti MG. Medial epicondylitis. Techniques in Hand and Upper Extremity Surgery, 7(4):190–196. 2003. ↑ 5.0 5.1 5.2 5.3 Shiri R. et al. Prevalence and determinants of the lateral and medial epicondylitis: a population study. American journal of epidemiology, vol. 164 n° 11, pag 1065 – 1074. 2006 September. ↑ 6.0 6.1 6.2 6.3 Polkinghorn BS. A novel method for assessing elbow pain resulting from epicondylitis. Journal of chiropractic medicine, vol. 1 n° 3, pag. 117 – 121. 2002. ↑ 7.0 7.1 Schipper ON et al. Nirschl Surgical Technique for Concomitant Lateral and Medial Elbow Tendinosis: A Retrospective Review of 53 Elbows With a Mean Follow-up of 11.7 Years. The American Journal of Sports Medicine 39: 972. 2011. ↑ 8.0 8.1 Birrer RB. Sports medicine for the primary care physician. 3rd ed. Florida: CRC Press LLC; 2004. ↑ 9.0 9.1 KM K. Overuse tendinosis, not tendinitis—Part 1: A new paradigm for a difficult clinical problem. Physician Sportsmed. 2000. ↑ methodistorthopedics. [Online]. Available from: http://www.methodistorthopedics.com/medial-epicondylitis-golfers-elbow. ↑ 11.0 11.1 L M. Medial epicondylitis. vol. 91 n° 1, pag.23. 1959 July. ↑ Frontera WR. Essentials of physical medicine and rehabilitation; musculoskeletal disorders, pain, and rehabilitation. 2nd ed. : Saunders; 2008. ↑ 18.0 18.1 Cardone DA. Diagnostic and therapeutic injection of the elbow region. American family physician, vol. 66 n° 11, pag. 2097 – 2100. 2002 December. ↑ Shahid M. et al. Operative treatment improves patient function in recalcitrant medial epicondylitis. Ann R Coll Surg Engl ; 95: 486–488. 2013. ↑ Chang HY et al. The Effectiveness of Kinesio Taping for Athletes with Medial Elbow Epicondylar Tendinopathy. Int J Sports Med ; 34:1003–1006. 2013. ↑ Fan JZ et al. Predicting Work-Related Incidence of Lateral and Medial Epicondylitis Using the Strain Index. AMERICAN JOURNAL OF INDUSTRIAL MEDICINE, 57:1319–1330. 2014. ↑ Pransky G. et.al Measuring Functional Outcomes in Work-Related Upper Extremity Disorders: Development and Validation of the Upper Extremity Function Scale. Journal of Occupational & Environmental Medicine: Volume 39 - Issue 12 - pp 1195-1. 1997 December. ↑ Shultz SJ. Examination of musculoskeletal injuries.. USA, Human Kinetics, p295. 2000. ↑ Ciccotti MC. Diagnosis and treatment of medial epicondylitis of the elbow. Clin Sports Med. 2004. ↑ Vangsness CT. Surgical treatment of medial epicondylitis. The journal of bone and joint surgery, vol. 73B n° 3, pag. 409 – 411. 1991 may. ↑ Cho BK et al. Mini-open muscle resection procedure under local anesthesia for lateral and medial epicondylitis. Clinics in orthopedic surgery, vol. 1 n° 3, pag. 123 – 127. 2009. ↑ Kwon B. The Fascial Elevation and Tendon Origin Resection Technique for the Treatment of Chronic Recalcitrant Medial Epicondylitis. [Online]. ; 2014 [cited 2014 May 2. Available from: http://www.ncbi.nlm.nih.gov/pubmed/24758782. ↑ Suresh SPS. Medial epicondylitis: is ultrasound guided autologous blood injection an effective treatment? biomedical journal of sports medicine, pag. 935 – 939. 2006 september. ↑ Sang Seok L. et al. Effectiveness of Initial Extracorporeal Shock Wave Therapy on the Newly Diagnosed Lateral or Medial Epicondylitis.Ann Rehabil Med 2012; 36(5): 681-687. ↑ Kertzman P. LM,PA,EB. Shockwave treatment for musculoskeletal diseases and bone consolidation: qualitative analysis of the littératur. rev bras ortop.;50(1):3–8. 2015.